It was in about 1948 or 9, I was about 10 years old, and I was visiting my Diver grandparents near Rockdale, the Sipe Springs area. 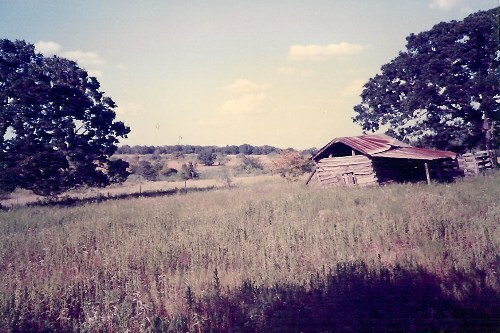 I dearly loved this poor little farm. I knew that it loved me too, the trees, the sand, the chickens, well maybe not the grass burrs. But if I could have stayed there forever I would have. Anyway, I was wandering around just looking at things when I came to the cow feed trough. It was a long box with four legs. Well I thought it would be fun to walk along the sides like a tight rope walker, so I got up on it and did pretty good for a while, but then I made a little slip and down my foot went through the bottom and right on a nail. OUCH!! I had to pull the board away from my foot because the nail was stuck tight. I hobbled to the house and told Gramaw what happened. She grabbed my arm and walked me back to the barnyard to see which nail had got me. Somewhere along the way she had picked up a hammer and she started working on that nail. When she got it out, I was led back to the house where she dropped the nail into the Kerosene can. "All the nails your daddy ever stepped on are in there." She said. She cleaned the blood off my foot with a kerosene soaked rag then wrapped my foot in another kerosene soaked rag. And said "That's to keep it from getting festered." And it didn't. Plus the puncture got a good bleeding from all the hopping to and from the house and back. Gramaw knew what to do and it worked. I sure did love my gramaw.